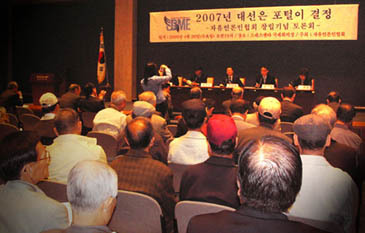 A seminar on the influence of internet media on the 2007 presidential election goes on in Seoul. South Korea is unique among 10 countries polled for the BBC, Reuters, and the Media Center in the amount that people are turning to the Internet for news. Fully 34 percent of South Koreans say the Internet is their most important source of news, compared to only 9 percent worldwide. Television is still most important to 41 percent of South Koreans, and national television is the most trusted news source. 76 percent say they have "a lot" or "some trust" in national television, but also 55 percent trust news websites, well above the worldwide average of 38 percent. South Korea is also one of the countries most trusting of blogs, with 38 percent compared to the world average 25 percent . South Koreans also place the highest value of any country in the ability to access news online. 85 percent say they value the opportunity to get news over the Internet. The Internet may be popular in South Korea because of low trust in the media generally. Just 45 percent of people in South Korea say they trust the media, and this has remained steady since four years ago. Only Germans have lower trust in the media, with 43 percent . Trust is causing people to change their media sources. 39 percent of South Koreans have stopped using a media source in the past year because it lost their trust. Worldwide, 28 percent have switched because of a loss of trust. People in South Korea are also worried about interference in the media, both from government and media executives. 71 percent say the government interferes too much, and 63 percent disagree that journalists can operate free of the influence of owners. There is also considerable resentment at foreign influence over South Korea's media. 71 percent agree that there is too much foreign influence in the media, a figure that is higher only in Brazil (77 percent ). The other countries polled were Brazil, Egypt, Germany, Great Britain, India, Indonesia, Nigeria, Russia and the US. The East Asia Institute conducted the poll in South Korea for international polling firm GlobeScan. — Strong appetite for the media around the world. 72 percent across the 10 countries follow the news every day (also 72 percent in South Korea). — Most people worldwide (77 percent ) prefer to check several sources of news; 79 percent do in South Korea. — A majority around the world (65 percent ) and in South Korea (64 percent) believe the news is reported accurately. — Many South Koreans (64 percent) are concerned that there are not enough ethnic minorities in the media. 1000 South Koreans were interviewed face-to-face between 3 and 4 April 2006. South Korea results are considered accurate to within +/- 3 percent, 19 times out of 20. The total sample worldwide was 10,230. NOTE: A background release, giving full details of the global results and further information on the other nine countries is available at www.GlobeScan.com.